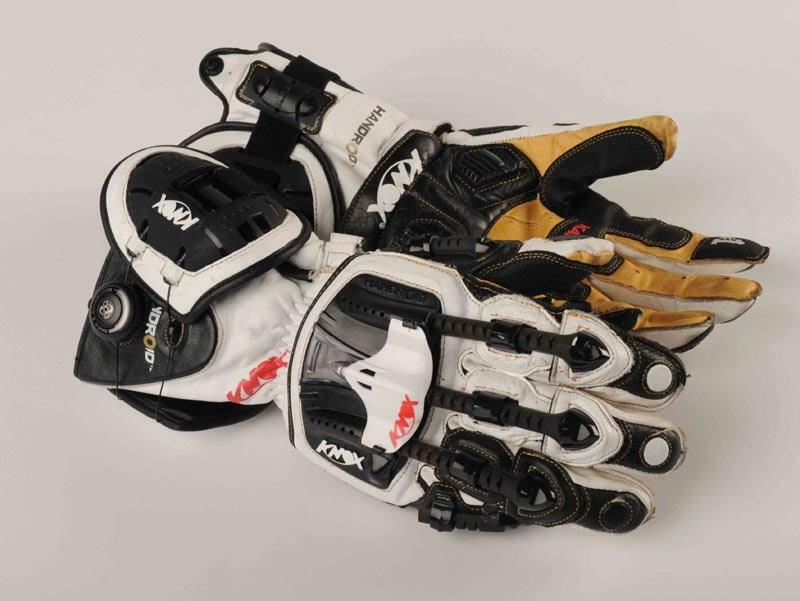 Knox have produced a number of versions of their stylish, futuristic Handroid race gloves and we at MCN simply can't get enough of them, reviewing every pair along the way. Below is a compilation of our staff product reviews, starting with the latest pair and ranging all the way back to 2010. What's good? These are some of the best gloves I’ve used, offering great comfort, good feel and a sense of solidity that I find reassuring. With a kangaroo palm and leather back, they’re fully loaded with armour, including exoskeleton finger, thumb and knuckle armour, a gel pod that covers the back of the hand and a scaphoid protector. There is also the ratchet-style wrist fastener and cuff sliders. It all adds up to giving you confidence and faith in their abilities. I’ve crashed in Handroids before and I was impressed by their protective abilities and their integrity. I’ve been equally impressed with how well they’ve stood up to a lot of miles. What's not? They may be too fussy for some – and on more than one occasion the knuckle armour has popped out of its guide when I’ve pulled a brake or clutch lever in. What’s good? The Knox Handroid is certainly a glove that looks the part. The twist-action Boa lacing closure at the wrist and exo skeletal structure along the fingers looks seriously cool. I was initially sceptical and thought this was purely style over substance, but the closer you look the more you notice just how many intricate safety features the Handroid has. For a performance-inspired glove these have been very comfortable on my daily commute too. A leather seam also runs up the index finger on both gloves to neaten up the stitching. Though this wasn’t designed to do anything else, it also works well as a visor wipe in the rain. What’s not? 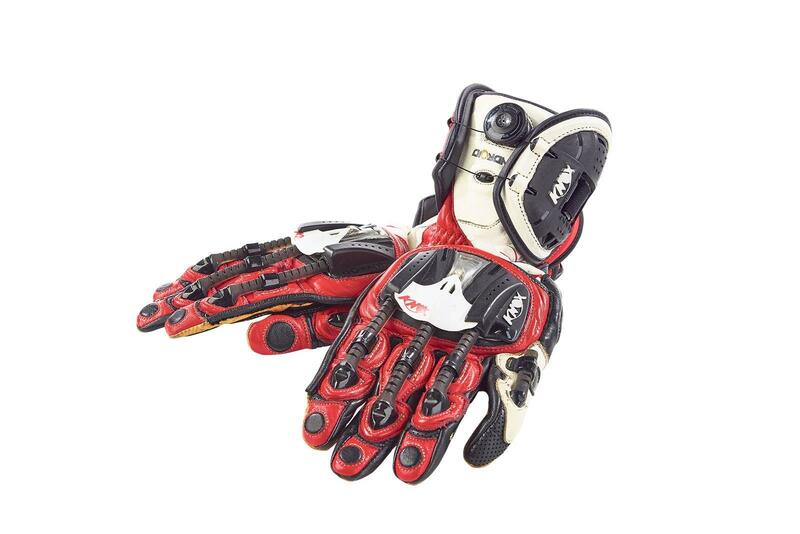 The Boa lacing system is easy enough to operate and taking the gloves off is fine, however a Velcro system would be a lot quicker to use when putting them on. This design also makes the wrist of the glove quite bulky, meaning I can’t fit them inside my textile jackets when riding. What's good? I think the Handroid gloves look really cool, although many don’t. Knox gloves seem to be an almost perfect fit for my hands, and it’s the same with the Handroids – none of the fingers are too long or too short. 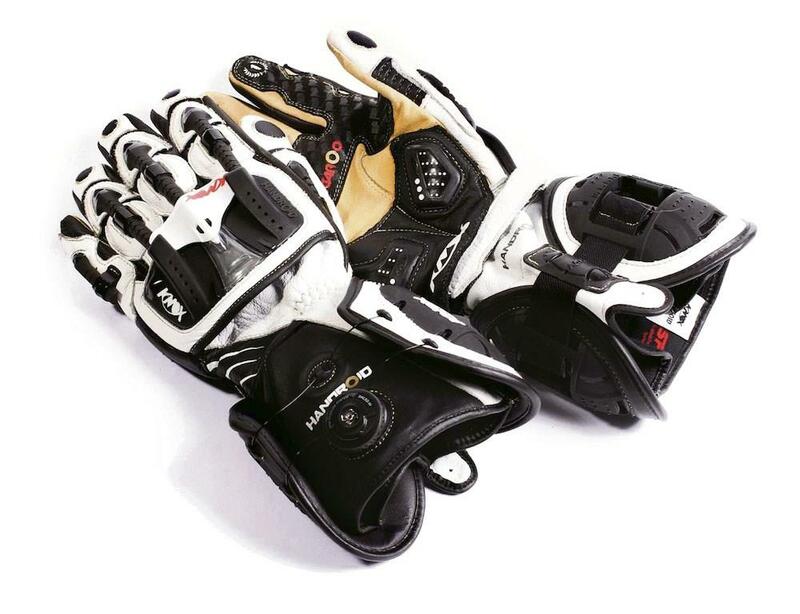 The kangaroo leather on the palms feels soft and supple, while the leather on the rest of the gloves feels substantial without being too bulky. I’ve been a fan of the BOA closure system on previous Knox gloves, and it feels much better on these. 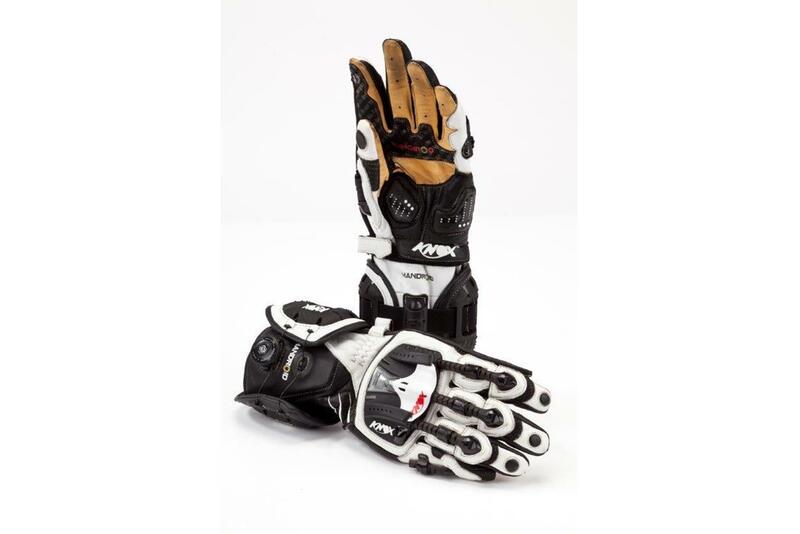 It operates much smoother, feels more secure and much stronger than on other Knox gloves I’ve used. What's not? They’re quite pricey and the sci-fi exoskeleton styling might not be to everyone’s tastes. They’re taking a long time to bed in and still feel a little clumsy and uncomfortable, with the Velcro wrist closure on the right wrist digging in no matter how loose I leave it. I’d also like a little more venting for warmer rides. What’s good? This is the third time I’ve worn Knox gloves at the TT, and these are the second generation gloves that are now CE-approved. They have also changed the small venting spoiler on the back of the knuckles to make it sturdier. 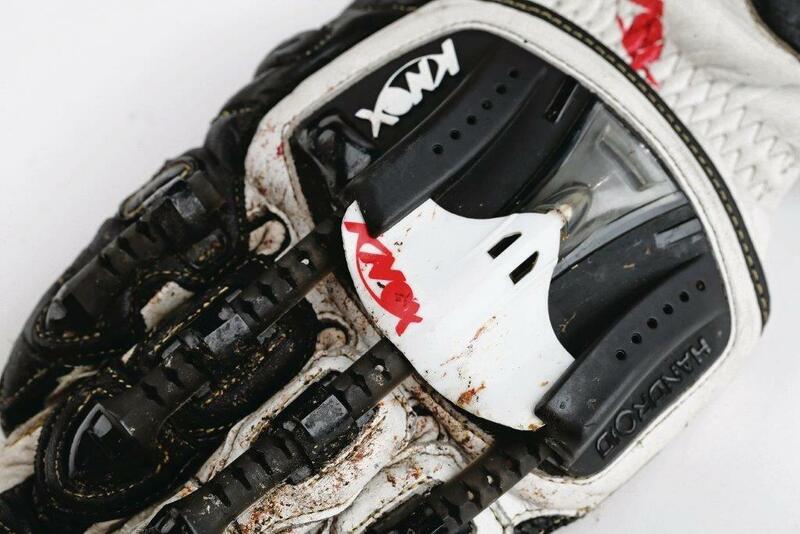 I actually lost a vent at the North West three years ago on the prototype glove. But these were faultless at the TT. The feel is excellent through the kangaroo palm, and despite the huge amount of fast miles I suffered no blisters. All I want to think about at the TT and North West is the next apex, the next corner - not my kit. I never had to think twice about my gloves, which means they were perfect. The protection appears excellent, plenty of protection on my palms and wrists, unlike some gloves. I also like the way they are easy to adjust, as I’m forever twitching and playing with my gloves before the race. At just shy of £170 I don’t think they are badly priced either. What’s not? For my tastes they are a bit flash and ‘look at me’ when I’d prefer understated. I’m forever being asked about them as everyone thinks I’m minted because they look so expensive. What's good? They have to be the trickest gloves on the market, everyone has commented on them favourably, and it’s not just for show. The fastening mechanism works really well, simply turn the dial to fasten the glove effectively and quickly. According to Knox they’ll never come undone, and taking them off is much easier than some gloves, which can be a pain when you are in a rush. Comfort wise I’ve raced in them and never had a problem. They have a nice feel, too – soft leather on the fingers gives great feedback through the bars. What’s not? For me, the armour on the lower hand is just too intrusive. It digs in a little and is bordering on painful at times. I’ve chatted with other riders, who have the same glove, and they don’t have a problem, but for me on my Yamaha R1 it’s just too much.